Our flight to Europe was long starting in Sydney going to Hong Kong (9 hours) with a 6 hour stop over in Hong Kong followed by a 13 hour flight to Milan another stop over (3 hours) and a 2 hour flight to our first Greek stop Mykonos. In total it took around 36 hours to get there. Millie was such a dream and we were lucky enough that there was an extra spare seat/bed for her on both flight so she slept a lot of the way. We only had a one night stop in Mykonos. 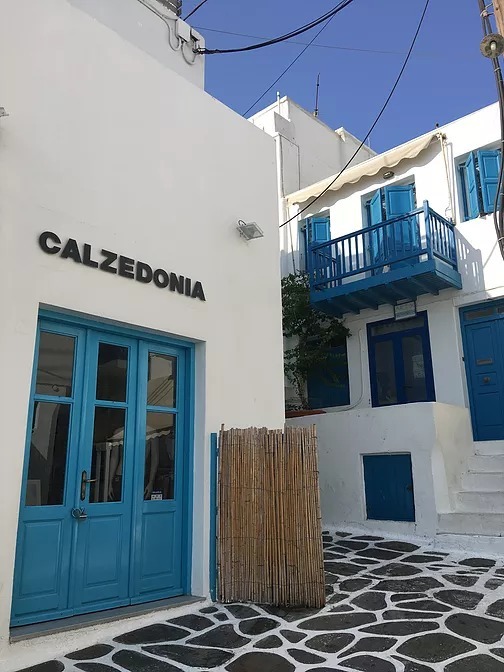 We stayed at "Hotel Nazos" which was situated just above the central area of Mykonos and took about 10 minutes to walk right in to the middle. It was a lovely little motel, perfect for a night stop over. We stayed in Naxos (central) at "Aegon Hotel" - the location was great, the pool was beautiful, very central and the Agios Georgios Beach was only 100m down the road. But the actual motel rooms were not great, a bit old - very affordable but the beds were very hard - we wouldn't book again. We stayed at the "Cliff Side Suites" in Firostefani. This motel was absolutely stunning. The location was amazing and the pool on the cliffs edge was to die for! It's everything you see on those travel blogs or insta models and blogger pages and more!! 100% recommend and will definitely be back. Just keep in mind if you are traveling with kids that motels in Firostefani are on the cliffs edge meaning there are A LOT of stairs. 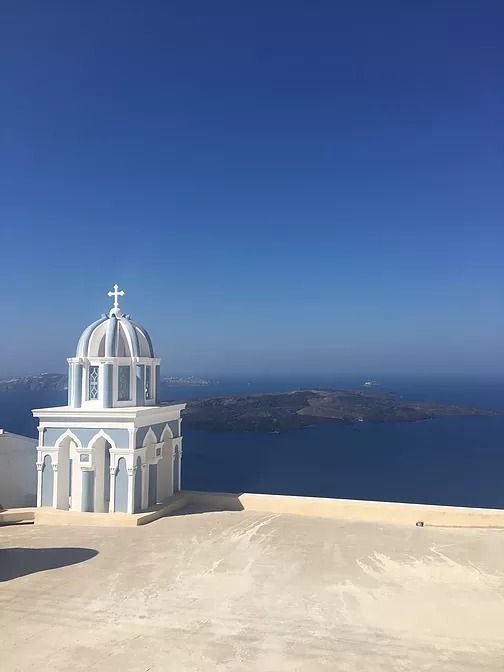 If visiting Santorini I would definitely say to choose to stay in Firostefani as it is not as busy as Thira, more relaxed and perfectly situated on the cliffs.... HEAVEN!! There was also cot for Millie which made life easier for us all. Eating gluten and dairy free can be difficult on holiday so I always choose the simple options and in Greece the Seafood and salad is my favourite, so much beautiful fresh octopus and fish, so many fresh veggies and lots of green goodness in their salads. When speaking to the locals about how beautiful the food was they explained to us that everything they eat is grown locally so if they can't grow it they don't bother eating it therefore it means everything is so fresh and healthy! The Greek people didn't seem to understand allergies as much as other places I have visited so if you suffer from allergies I would recommenced either have a translated piece of paper with your allergies written down to show to the staff or to keep it as simple as possible when ordering. If you visit Santorini you must go to "IDOL RESTAURANT" - the lobster was to die for!! As you know, I LOVE WINE and I was absolutely impressed with the Greek wines especially those from Santorini. A lot of people have asked me what we did and the must do's for Greece. To be honest we used Greece as a time to completely relax and switch off. After a very busy year we needed a break and it was absolutely perfect for us. The white buildings and contrasting doors along their pebble streets made for a lot of beautiful photos and lot of adventuring through the street. We were only there for one night so we spent the day wandering the streets and enjoying cocktails by the sea. No one warned me about how windy it can get and it certainly wasn't pleasant away from the sheltered streets of Mykonos. Mykonos is known as the party island and the least family friendly of the 3 we visited. Naxos would be the most family friendly and affordable of the 3 islands we visited. It gives you a taste of the Greek lifestyle everything from the water, the food and the accommodation is that bit cheaper as it's obviously not as touristy as the other 2 places we visited. 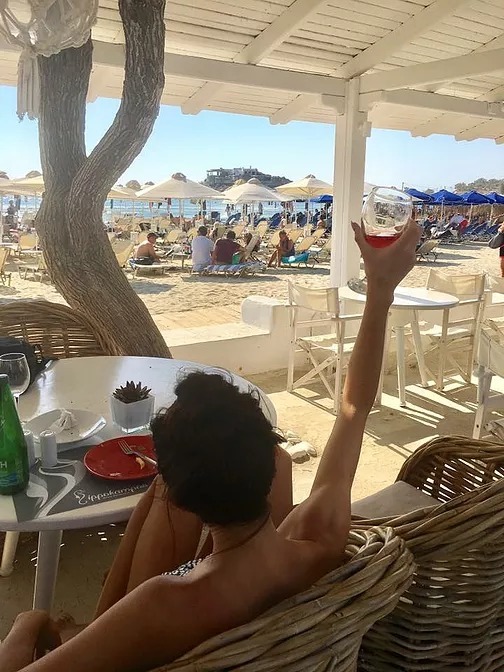 There are beautiful beaches such as "Plaka beach" which we spent the day relaxing on beach chairs on true European style. 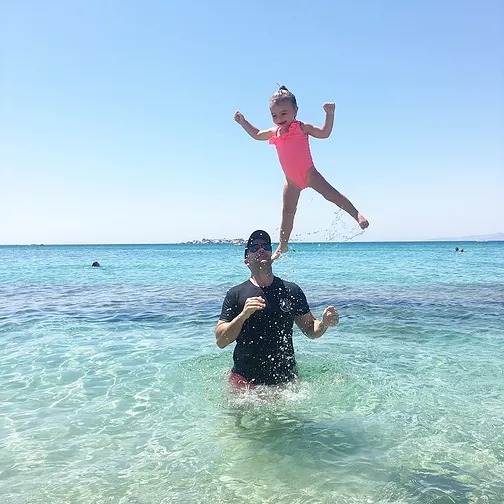 We stayed in the central part of Naxos but if we return again we would choose to stay at a resort a"Plaka beach" as it would be more relaxing and perfect with kids. There is also a beautiful port where the street is lined with restaurants which make for the most perfect sunset dinner. In the mornings we would walk to the ancient ruins on the top of the hill near the port. The heat was intense so you can cool down by jumping in to the crystal clear water below. OH MY GOD!! Where do I start?! Was I dreaming or is this place actually real life? The views are incredible, absolutely mind blowing. You know those amazing photos you see of this place? Well times that by 1000 and you still aren't close to the feel you get and the actual beauty of this place. We spent our 3 days walking in the mornings (be warned its hard work with a pram) to explore the town and relaxing pool side sipping cocktails in the afternoon. We hired a baby sitter from the motel for one night which cost around $50 Euros and David and I got to have a Santorini date night at sunset. The motel recommended "IDOL" in Thira and it was perfect. We enjoyed lobster and delicious local Santorini wines while watching an incredible sunset. WOW!!! A little tip when organising dinner reservations in the Greek Islands is to book them around 8pm so you get to enjoy the stunning sunsets. There are lots of other incredible things to do in Santorini such as the Red, Black and White sand beaches , sunset cruises which I have read are incredible especially if you do the more private ones with only 8-10 people, wine tours, volcanoes etc but for us we just wanted to relax and to be honest we wanted to soak up the great weather, views and services of our motel. 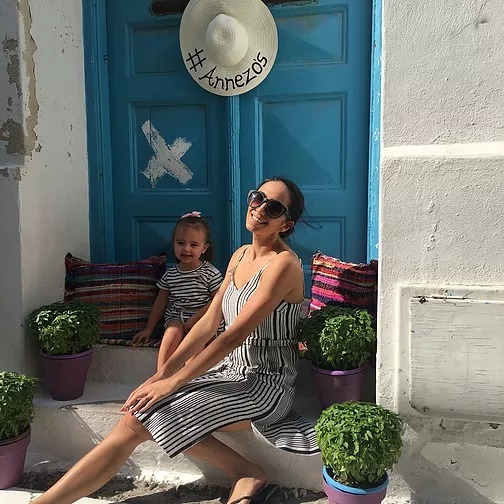 Would I recommend traveling the Greek Islands with kids? Absolutely, BUT you must be prepared for the expense - it's not a cheap place, stairs and the heat (if you're traveling in Summer). 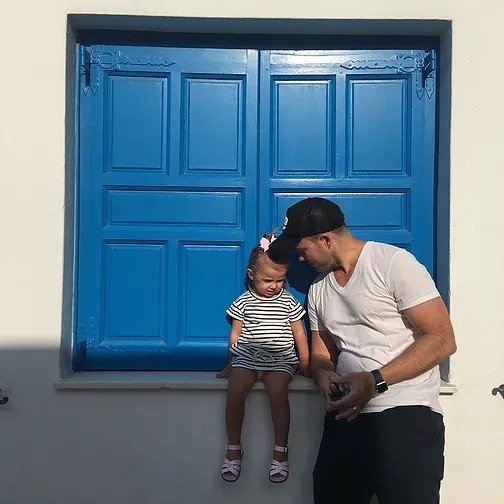 You need patience and the motivation to get you and your kids around in a place like Santorini BUT it is worth it for the magic, beauty and culture of these Islands. I would recommend taking a travel stroller such as the "Baby Jogger City Tour" as it folds right down to a backpack size and it only weighs a few kg's so you can carry it when you can't push it and when walking down stairs but still have the convenience of putting baby in there in the busier crowds and at nap times etc. We accidentally forgot our baby carrier which would have come in very handy so if you have one don't forget it!! Traveling between the islands is done by ferry which is an experience in itself. The boats are busy and chaotic with thousands jumping on and off as well as cars and motorbikes in some cases so be prepared to hold on to your kids tight when boarding and disembarking. The winds and choppy seas also gave me motion sickness so make sure you pack some medication if required for you and the kids - of course chat to your pharmacist and doc about which one is right for you. Santorini is my absolute pick of the 3 and Naxos would be the most affordable, family friendly so if you don't like the challenge of stairs and a more relaxed, resort style holiday I would say Naxos would be perfect for you. 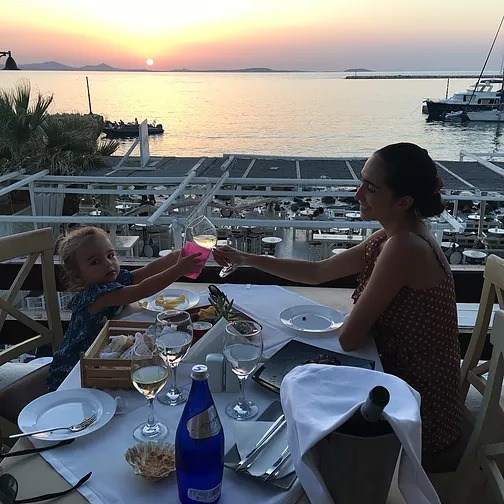 My highlights of The Greek Islands would be the delicious seafood, the views and the friendly people who LOVE children. Thanks to everyone for following along my family holiday. We are having the most amazing time making memories to last a lifetime! Feel free to message or email if you have other questions.